Bengaluru FC are set to make footballing history on Saturday, by becoming the first Indian side to appear in a continental club final when they take on Al-Quwa Al-Jawiya of Iraq in the AFC Cup. In this momentous time for Indian football, Martin Lowe caught up with regular SFG contributor and dyed-in-the-wool Bengaluru fan Ahmed Hashim to discuss what this means for the team, the fan base and India as a whole, and what legacy this will have on the national team’s hopes of qualifying for 2019’s Asian Cup. As remains the case in small portions of the continent, Asian football is way down the pecking order in terms of mainstream consciousness. 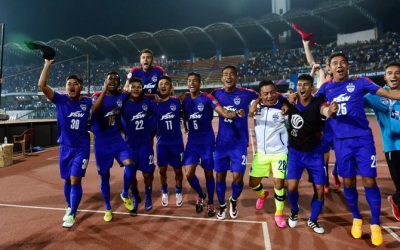 However, with their run to the AFC Cup final this year, Indian pacesetters Bengaluru FC are slowly changing this within their country. Throughout this year’s campaign, they have steadily grown in popularity, with ever increasing attendances, an admirable work ethic but. most importantly, collecting the results needed along the way. The AFC Cup, the Europa League equivalent in Asia, has one difference from its European counterpart: it focuses entry to lower ranked leagues rather than clubs. Whilst the AFC Champions League remains a closed shop to the top 10 leagues in Asia, the AFC Cup creates an organised competition, free from the stronger more resourceful leagues, ensuring a victor from outside the classical heavyweight nations. In a West Asian dominated field, Malaysia’s Johor Darul Ta’zim clinched the crown last year, and, in the same vein, Bengaluru will aim to retain an Eastern stranglehold on the trophy after beating the holders in this year’s semi-finals. Football in India, as is widely known has tended to be a side show on the sporting scene behind cricket and hockey. Where it has been embraced, the fans have tended to focus on the typical European leagues, with the domestic I-League usually playing second fiddle to its glamorous competitors from the West. India sits in a unique position in world football, in the fact that it runs two separate leagues. The domestic I-League has been around since 1996, however in the last few years the greater financed Indian Super League was introduced to offer an alternative format to regular league football. This high profile venture is largely seen by casual fans outside the continent as the prominent league within India, however due to its exhibition nature (it only runs for 3 months of the year), the I-League remains the official league of the AFC and subsequently has teams playing in continental competitions, such as the AFC Cup. The relationship, as you would expect, is difficult. The initial hype of the Indian Super League has plateaued for now, not reaching the same heights as the highly successful Indian Premier League in cricket, mainly due to the lower standards of the playing staff. The overseas players were initially big names such as Robert Pires and Elano, either past their prime or even retired in the former’s case; nowadays the age profile has lowered, but consequently so has the star factor. As we stand the confusion of having two separate competitions is proving detrimental for both parties, however a merger may be a difficult avenue to breach with plenty of ill feeling still existing between one another. It’s clear the status quo isn’t sustainable, and a solution needs to be brokered to go forward, even if there are some big name casualties along the way. India last qualified for the Asian Cup in 2011, so it can hardly be regarded as a lengthy dry spell for the national team on the continent. However, while in the main national team in Asia has improved, India have at times seemed to have been left stagnant. While qualification for the 2018 World Cup was rarely thought a possibility, the fact India finished bottom of their Round 2 section – below the likes of previous minnows Guam – is worrying. Throughout it all another Englishman Steven Constantine continues to keep his job. For the moment patience in his leadership seems to be well placed, as India went on to clinch the SAFF Championship late last year before a comfortable 7-1 aggregate victory over Laos in the last round of Asian Cup play-off matches in June to confirm their place in January’s Round 3 draw. The recent improvement of form, alongside the likes of Bengaluru succeeding in the club game, gives Ahmed hope for the future and possibly a chance at qualifying for UAE in three years’ time. Indian football is far from a steadied entity, given the mess which remains in the domestic game. However, through the fog comes a national team with renewed hope and Bengaluru as the blue lightning rod that is gaining success for not only their team but the country as a whole, on and off the field. Come Saturday’s final in Doha, we will see if they can go one step further and clinch India its first modern day footballing continental trophy.